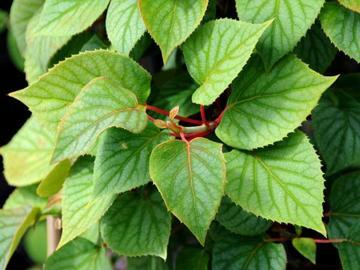 Woody climber with very attractive silvery, blue-green, heart-shaped leaves, turning yellow in autumn. Creamy white, flat-topped, hydrangea-like lace cap flowerheads in summer. Self-clinging by small aerial rootlets produced from the reddish-brown stems. Fertile, moist, well drained soil in full or part shade. Will grow in sun if not too hot and dry. Apparently this is a naturally occuring geographical variant of the species.